Size: 780 sq.ft. - 1230 sq.ft. Wilton Terraces is a residential project containing two towers in the Mohammad Bin Rashid City(MBR) of Dubai. The project was introduced in the year 2017 by Boutique Developer "Ellington". After receiving more demand for Tower I homes the developer is presenting one more tower next to Tower I. Wilton Terraces is the fifth project in Dubai by Ellington Properties. Ellington Wilton Terraces will be the best residential option to have in Meydan, Dubai. The entire project overlooks the water features and green gardens within the community. These towers are interconnected through a podium level featuring 1 BR to 2 BR residences ranging between 785 sq.ft to 1236.67 sq.ft. It is a true milestone for Ellington Properties that creates idyllic and quality lifestyle for the residents and can bring long-term value for investors as well. Wilton Terraces tower I & II is a contemporary residential development being executed by the award-winning architectural firm Perkins &Wills.Wilton Terraces Tower I will feature 140 units and Tower II housed with 143 Units with a wide swimming pool lies between these two towers of 12-storeyed.The storage units of Wilton Terraces are designed with bendable shelves which offer maximum usage capacity and the kitchens are lined with custom cabinet, polished counter tops. The apartment's kitchens are furnished with fully integrated refrigerator, signature sinks & fixtures. 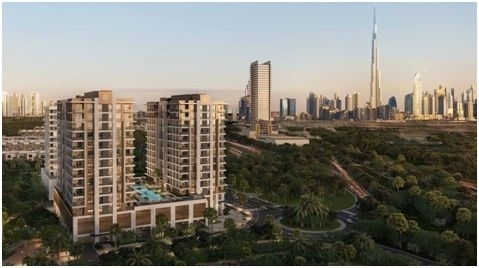 Wilton Terraces II is only 3 km away from Burj Khalifa and Downtown Dubai. Moreover, it is strategically located off Al Khail Road. Residents will also have access to a recreational area, a swimming pool, children’s pool and greenery with barbecue area.Wilton Terraces located near the Al Khail Road & Al Ain Road in the MBR City. It's an ideal neighborhood for living with numerous parks and leisure facilities within walking distance. Each villa will have two and four dedicated parking spaces with a driver, maid's room, cinema and gymnasium(6 bedroom villa only). The balconies offers view of the pool and leisure deck(the perfect place to relax) and ground-floor apartments offering private garden. Wilton Terraces Community is only 3 km away from Burj Khalifa & The Dubai Mall. Wilton Terraces lies at distance of 6 minutes from Dubai International Finance City, 12 minutes away from Dubai International Airport and 16 Kilometers from the Jumeirah Public Beach. Ellignton Wilton Terraces project is located in Mohammed Bin Rashid Al Maktoum City, Meydan, Dubai, UAE. Residents of Wilton Terraces can enjoy lots of amenities like Community View, Cycling tracks, Fitness Centre, 24 hours Maintenance, Balcony, Bank/ATM Facility, Basement parking, Basketball Court, Children's nursery, Children's play area, Communal gardens, Gymnasium, Jacuzzi, Laundry Service, Maid's room, On mid floor, Pets allowed, Public park, Public parking, Public transport, Recreational Facilities, Built in wardrobes, Bus services, Central air conditioning, Central heating, School, Shared swimming pool, Shopping mall, View of gardens, View of parkland.